Ok, so no, this post is not about girls getting wet & wild, sorry to disappoint, but it is about the season. It is about the fact that I live in a place that has a drastic change this time of year where we change from “high season” to “low season”. The wind dies down at night and our days become HOT. We debate with whether to turn on the air conditioner or not and really take to the Mexican ways of an afternoon siesta. With this change in season, things really start to slow down. We get fewer and fewer cruise ships a day and in general less people come to the island. This time of year is great for budget travelers because rates in hotels and vacation rentals also decrease. I too have slowed down with just a few “food tours” and cooking gigs here and there, but this has given me the opportunity to cook for myself and read a ton (If you are wondering what is on my bookshelf….or iPad…I religiously read the Dining Times and have caught up on a bunch of other books….Taco USA, Deep Nutrition just to name a few). In a way, we are pushed into a natural break and I like that. I get to find inspiration again and focus on what I like to do. It also gives me time to plan for future goals of my business and to get ready to be slammed again in “high season”. My grocery cart of late has been filled with ingredients that are selfishly for me and no one else (though my husband has been reaping the benefits of this cooking kick). Certain spring vegetables just get me giddy. For the last few weeks I have been hooked on asparagus. I couldn’ not buy them from the store…those perfect skinny, bright green stalks of goodness. I grilled them, steamed them, smeared them with tarragon mayonnaise, chopped them up to pair in a cliche goat cheese & arugula salad (damn I wish I had a lemon, but I must note I have been super lucky to find fresh baby packaged arugula…YUMMY!!!). I must admit I am envious of reading about particular spring vegetable varieties, especially the ever elusive spring ramp, but you know what I get early here…squash blossoms. That’s right. Beautiful, delicate, silky, yellow squash blossoms. And I was lucky enough on one of my food tours to share this special find with a fellow foodie…who was also amazed at the cost in which I bought an entire large bag of blossoms….15 pesos! After my tour, I ran home to look up recipes. In the past I made tacos from Mark Miller’s Tacos cook book with Oaxacan cheese and green chiles. Multiple recipes called for stuffing and frying…which I hadn’t done. So I decided to get messy in the kitchen and fry up a tasty batch of mascarpone & goat cheese stuffed squash blossoms. Mix flour, salt & pepper in a bowl. Separate mixture into two bowls. Set aside. Beat egg in a small bowl and add chopped garlic. Set aside. Prepare the squash blossoms by removing the stamens or pistols (see photo). Rinse lightly under cold water and place on paper towel to dry. In a small bowl, mix the mascarpone, goat cheese and purslane. Add a touch of salt and the olive oil. Mix well. This mixture can be refrigerated and made a day ahead. Fill squash blossoms gently, taking care not to rip the petals. Once stuffed, gently twist the ends of the petals together to retain the stuffing. In a deep skillet, heat oil for frying (about 1 inch of oil is necessary). Working in small batches, dredge each blossom through the three bowls; four, egg, flour. Turning to coat well in each bowl and tapping each time to remove excess. Fry blossoms, turning twice, until crisp and golden (about 3-5 minutes). Drain on paper towel, sprinkle with salt and serve immediately. (Pairs wonderfully with Sriracha….then again what doesn’t). Note: if frying the stuffed blossoms is too harsh and you notice loss of stuffing, you can always pan fry them with a thin layer of oil in a pan. Pan fry until golden brown, sprinkle with salt and enjoy! With the remaining blossoms I took a shot at Saveur’s recipe for Squash Blossom Soup. However, this soup just didn’t have enough depth for me and I would like to take it back to the drawing board. For one, I think chicken stock is a bit too strong and overbearing for the mild squashy flavor of the blossoms. I would recommend a mild vegetable stock. Also, I think “sweating” the blossoms in a bit of light olive oil or just a touch of butter would do some justice as well and bring out the flavor of the blossom rather than putting the raw ingredients into a boiling pot of water to “simmer for 10 minutes”. I will try this one again. 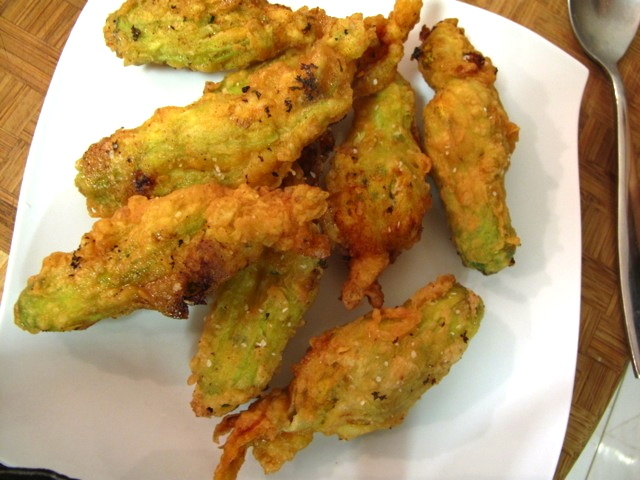 Interested in reading more about Squash Blossoms…check out this article from NPR. *Purslane – This was a new herb that I have never cooked with before, but found in the Squash Blossom Soup recipe. I decided to use it for my stuffed & fried recipe. Purslane is an Old World (North Africa, Middle East) herb, considered a weed in the United States. The taste is salty/ sour, but one interesting fun fact is that it contains more Omega-3 fatty acids than any other leafy vegetable plant…so eat up! Stamen v. pistols…damn you men…one lady squash blossom out of the whole bag!